12 X 10 X 2"
The pizza that your pizzeria bakes is out of this world, and the packaging that your customers receive their pie in should be the same. APlasticBag.com offers custom printed pizza boxes that are a great choice for pizzerias that are looking to differentiate their brand from other top pizzerias in the city. If your pizza tastes amazing but no one remembers your logo or your company's name, you are not going to generate a lot of buzz for your tasty business. When you have great tasting pizza and packaging that is bold, beautiful and memorable, you have the right recipe for a pizza pie that is sure to put a lot of money in the bank. Whether you opt to customize your pizza boxes with your pizzeria's logo, your company's name, a delicious slice of pizza, or something else, the team at APlasticBag.com will work with you in order to make your pizza box dream a reality. We have a large selection of boxes in different colors and sizes, and we can work with you to add any custom touches to the box that you think would benefit your business. When you buy pizza boxes at wholesale prices, you will be able to save money on packaging that you can put back into your business. 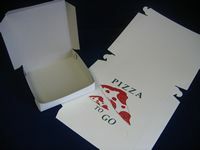 APlasticBag.com offers rush production capabilities on pizza boxes for those times when your business is booming. We also have a 100% on-time delivery guarantee that ensures you will have your boxes when you need them. To learn more about what we can do for you or to place an order today, all you need to do is complete our Sales Quote form. We will gladly send you a FREE, no obligation sample! 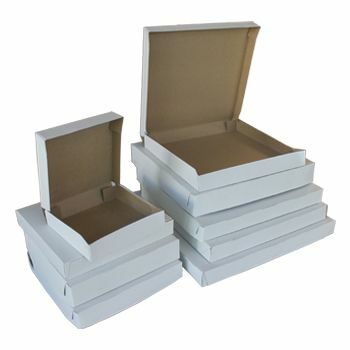 Your source for Pizza Boxes and Retail Boxes.